Your child is now in school and you would like to teach them to tie their shoes with strong bowties that will withhold the running, but can be easily undone later. Here are a few tips to help teach them! At some point, we figure our child should be able to tie their own shoes but it seems as if each time we tried teaching them, we failed. Their daycare educator thought it was dangerous to let them do it because they could have tripped while crossing the street, their teacher thinks that transitions are taking too much time because of your child and your child preferred their old shoes. That is how, each time, you decided to go back to Velcro. How can you teach your child once and for all to tie their shoes? First, to tie shoes, you need… laces. Many tools exist on the market and even if you can use their own shoes, it will be easier to get them to practice with a lacing book or a toy shoe. 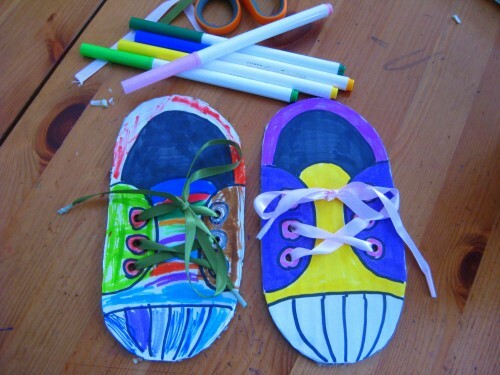 You can even cut shoe shapes in a cardboard box and lace them. It is environmentally friendly, convenient and free. You will also need time. Saturday morning is a great moment to practice slowly, without any rush and that is what's most important! If you want your child to fail and try again, over and over, they will need time, lots of it. Having laces in different colours could also help your child understand which goes over which and what happens to the blue lace when they pull the yellow lace, etc. It seems a bit complicated for very young children and seeing colours will help your child memorize and understand. There are several techniques to tie a knotted bow but we will focus on four: the square knot, the granny knot, the bunny ears and the superfast technique. All techniques start with a simple knot (cross your laces, tuck one under and pull them tight). Bunny ears are super easy for kids! Make one loop with the first lace, another with the second and just the way you did with your simple knot, cross them, tuck one underneath and pull. However, if you want your child to understand the “proper method” right away and believe you have the patience to do so, there are three ways to tie your bow. Show them every step slowly and in several angles. The granny knot and the square knot are both “loop, swoop and pull” techniques. The difference between the two lies in the fact that a granny bow is undone much more easily (and randomly) than the square knot. The square knot must be started with the lace that is on top of the basic simple knot and is commonly taught as left over right, tuck under, right over left, tuck under. The granny knot is the first step repeated twice: left over right, tuck under. There are several good videos on YouTube that can help you understand what you have been doing naturally for years. The last technique is the superfast technique. Because it looks magical, it should give your child some motivation. Grab your laces with your pinkies, then make claws with your index finger and thumb, pass your right hand over, the left one under, make an X with your claws and pull. You can also let Will Jackson explain. As your child is learning, tell their grandma, aunts and, uncles to let them tie their own shoes without interfering. If they help your child, they will not learn. Everyone must be patient and sooner or later, your child will do it naturally, just like reading and walking.